If you are buying from AliExpress for the first time, the tips mentioned below would ensure a happy shopping experience for you. Open (years) lists the number of years has the shop existed on AliExpress. The older, the better. For example, the shop (Foison Group) in the above example was established on December 9th 2012. The fact that the shop has existed for 3+ years speaks for itself that the seller is here to stay. Expensive items should be shopped from shops which have existed since long. 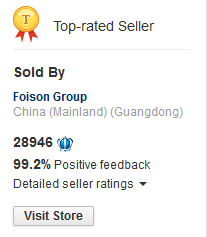 Top Rated Seller is a badge given to sellers who have provided excellent service over a period of time. Aliexpress reviews the sellers monthly and only the best out of best are promoted asTop Rated Seller. Feedback Score shows the number of 4 or 5 star ratings received by the seller (minus) the number of 1 or 2 star feedback received. Sellers with high feedback score are well established and are expected to provide good support around the clock. Positive Feedback shows the percentage of positive feedback received by the seller during the past 6 months. The higher the positive feedback, the better. But do compare the Positive Feedback with Feedback Score as new sellers will also have close to 100% positive feedback because they haven’t sold enough and hence no real feedback from end users. Number of product orders and feedback choosing a seller which has sold a good quantity of the product you wanna buy is a good idea. You’d also see buyer feedback related to the product making it easy for you to judge the quality. Established sellers also have a dedicated sales & support team which is usually available around the clock and you can contact them for any issues that may have. Sometimes very useful information is included in the item details/description section. Do NOT place the order by just looking at the product title and photos, instead check the description as well and there might be certain explanations that seller has left for the buyers. For example, the seller may state the features, specifications, compatibility, quality of the item and whether it is a replica or an original product. Shipping, refunds and support related questions are also generally answered in the item description. For many items, sellers offer their own set of guarantees. Others aside, one thing that you should definitely look for before buying expensive & branded items (…cough iPhones, Galaxies) is the Guaranteed Genuine tag. If a product that falls under this guarantee is found to be counterfeit, you will get a full refund (shipping costs included). Returns Extra is also a good choice to have. Under this, sellers agree to accept your items back if you do not like them for any reason. You surely need to pay return shipping costs, hence it only makes sense for expensive products. These details can be found under Buyer Protection section of the product listing page or under Seller Guarantees tab. Tip: Read our full article on Buyer Protection here. Before making a purchase, do communicate with the seller using the Chat or Messaging system that is provided by AliExpress. Always clear your doubts and ask any item details, shipping or delivery questions you may have. Some listings don’t mention the brand of the item and some others might have identical spelling to a branded product. These items can be knockoffs and do confirm with the seller if that is the case. Free shipping is usually sent via the National Post service and takes a long time to arrive. There is also an extended risk of items being delivered as broken or even never reaching the destination. So, while free shipping is okay for low priced goods, do choose some decent shipping service (DHL, EMS; etc) when buying items with high prices. Different countries have different rates at which duties are charged for imports. Duty Calculator is a good place to get an estimate, but it is not always correct. Depending on the customs inspector the actual customs imposed on your import can be higher or lesser than the one estimated by Duty Calculator. Also, please don’t ask your questions about how much customs will be charged, because we really can’t answer that. You place an order on 20th of August. The seller has not provided shipping details (or they don’t work) till 23rd and out of frustration, you open a Not Shipped dispute against the seller. The seller would then ship the items within the next few days and deny your dispute by providing/updating the shipping details. Now that your issue for dispute is resolved, you would be required to accept the resolution and close the dispute. Once you accept the seller’s resolution and close the dispute, the seller is super safe as you’ve lost the only chance of disputing the transaction that you get. If that’s not enough, you can’t even leave feedback for this transaction making the seller even safer. So, please use your dispute carefully and try not to waste it on anything except for Undelivered or Damaged product received. Update: AliExpress now lets buyers cancel an ongoing dispute. Cancelling does not close the dispute and you can open up a dispute again at a later stage before the purchase protection ends. This is important/useful if the seller is asking for more time (provided it is reasonable) or your question/query is answered in the communication. DO NOT ACCEPT the dispute unless you’re satisfied with what you have received and/or the proposal that seller has offered. When you receive the delivery of your product, don’t get too excited and confirm the receipt of the item. Do use it thoroughly for a day or two before confirming the receipt. If there is a problem with the item received, contact the seller and ask for resolution. If his replies are not helpful, chat with one of AliExpress’s support representative and discuss your problem. Open a dispute when they suggest you the same.